I'm not sure how or why I found this little fella, but I have to say I would ALMOST be tempted to get this for inclusion in my garden. 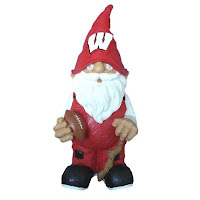 In fact, you could get a whole bundle of them and set up a series of dioramas in your yard for the super observant passerby to enjoy...UM gnome vs. Michigan State gnome. The dreaded Buckeye Gnome sneaks up on the Michigan gnome!